The RNI&B was completed between Versailles and Irvine, a distance of 60¾ miles, in 1890. 1 It included grades of up to 1.7%, a 253-foot tunnel at Marble Creek, and two bridges of 570-feet and 770-feet. The line hauled two daily passenger trains daily in each direction. At its western terminus in Versailles, the RNI&B connected to the Louisville Southern. The railroad was put into receivership on December 2, 1891, and sold under foreclosure in 1896. 1 It was later sold to the Louisville & Atlantic Railroad (L&A), incorporated for the sole purpose of taking over the RNI&B, on August 19, 1899. A 34¾-mile extension of the L&A was completed between Irvine and Beattyville in November 1902. 1 The L&A then acquired the 6½-mile Beattyville & Cumberland Gap Railroad, which offered a connection to the Louisville & Eastern Railroad (L&E) at Airedale (Beattyville Junction). The L&A stretched for 101.1 miles. Elsewhere, the Kentucky Highlands Railroad (KH) constructed a 6½-mile line between Frankfort and Millville in 1907-08. 1 The single track served the Old Crow and Old Taylor distilleries. The Louisville & Nashville Railroad (L&N) acquired the KH in 1909 and began work to extend the KH 9½ miles up Glenns Creek to Versailles. 1 The extension, which connected to the L&A, opened on May 1, 1911. Through trains were then scheduled to run from Beattyville west to Frankfort. The L&N saw the L&A as a potential revenue source, as it had desired a route into the southeast Kentucky coalfields for years. 1 The L&N acquired the stocks and bonds of the L&A on July 1, 1909, and then purchased the L&E in November 1910. But both routes, which connected to Jackson, did not provide a low-grade alignment. The L&N constructed a 29-mile route from Irvine to Winchester, but costly slides and right-of-way composed of soapstone and blue clay caused considerable delay. 2 Extensive pilings had to be installed for the roadbed to remain stable, and two lengthy trestles had to be built. One bridge over the Red River at Sloan was 2,200-feet long and 233-feet high, and another over Howard Creek was 2,100-feet long and 225-feet high. The low-grade alignment was not finished until May 14, 1916. The L&N built a yard at Irvine, a five-mile connection between Maloney’s Bend to Tallega east of Beattyville, and a second track between Paris and Winchester. 2 Afterwards, the L&N only used a part of the L&A from Irvine to Beattyville. The former L&A between Frankfort and Irvine saw much of its traffic dry up, and the section from Millville to Irvine was abandoned on September 30, 1932. 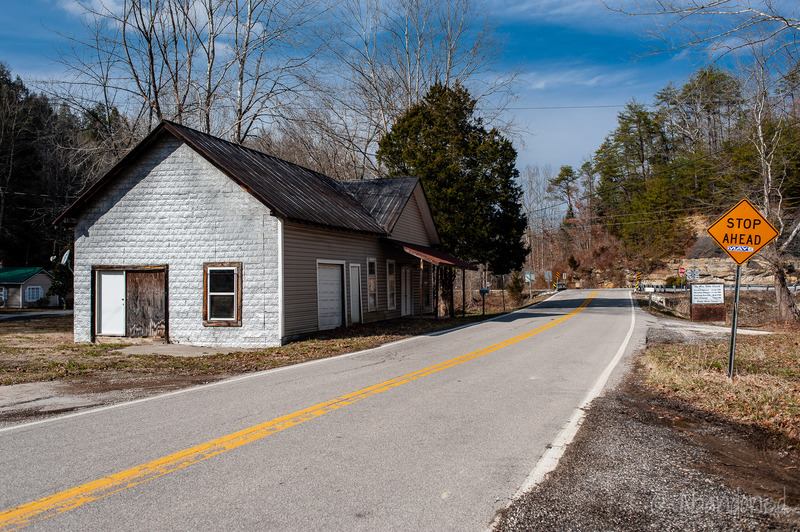 The section between the Old Crow Distillery and Old Taylor Distillery, and Cliffside, just outside of Frankfort, was retained until circa 1995. 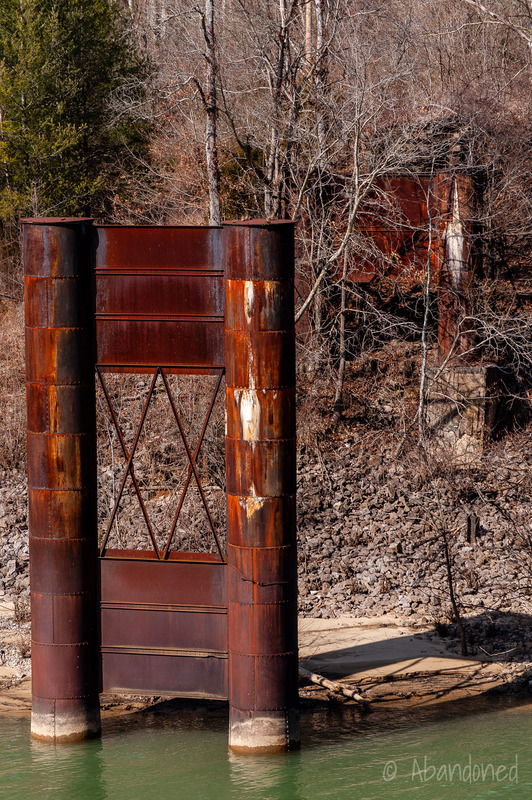 In early 1942, the dormant Kentucky River bridge at Valley View for the RNI&B was demolished. 3 Another at Irvine was taken down on November 17. 1 Both were taken down for metal to assist the World War II scrap metal drive effort. A branch line was built by the Kentucky Coal Development Company between March 1907 and January 1908 from Heidelberg to Ida May via Sturgeon Creek. 1 The three mile line was acquired by the L&A on November 1, 1909, and became part of the L&N in 1910. 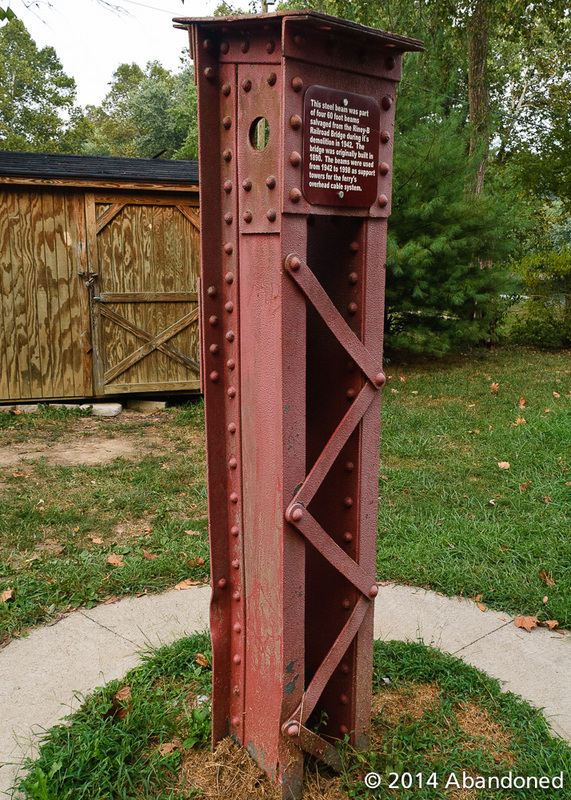 The spur provided a connection to the Kentucky, Rockcastle & Cumberland Railroad. A lack of traffic on the branch caused it to be discontinued on April 13, 1935. 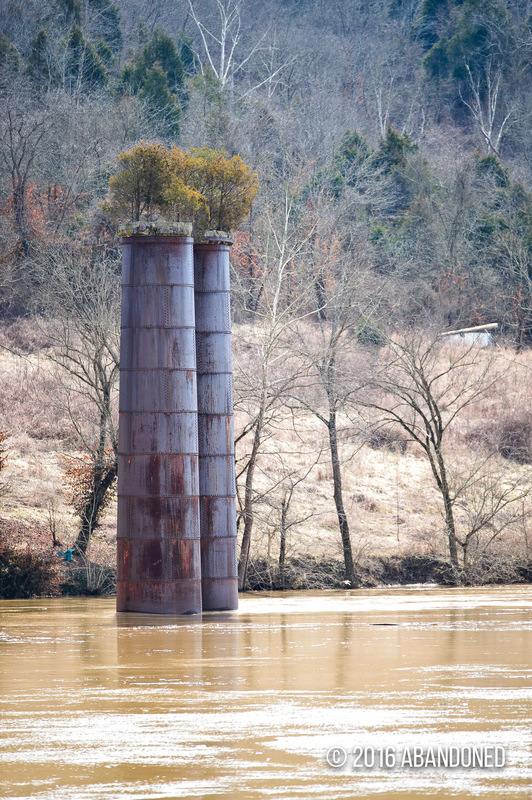 Pier at Valley View, Ky. over the Kentucky River. 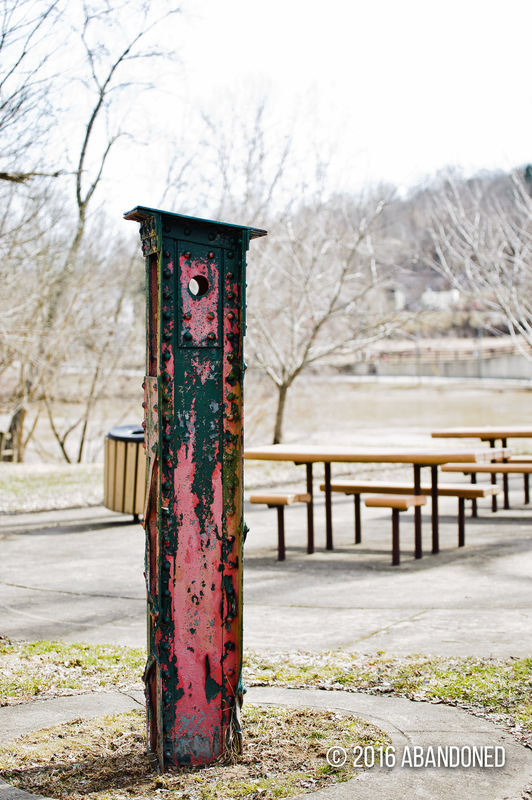 Old bridge component at the Kentucky River crossing in Valley View, Ky.
Former Kentucky River crossing of the Heidelberg-Ida May branch in Heidelberg, Kentucky. 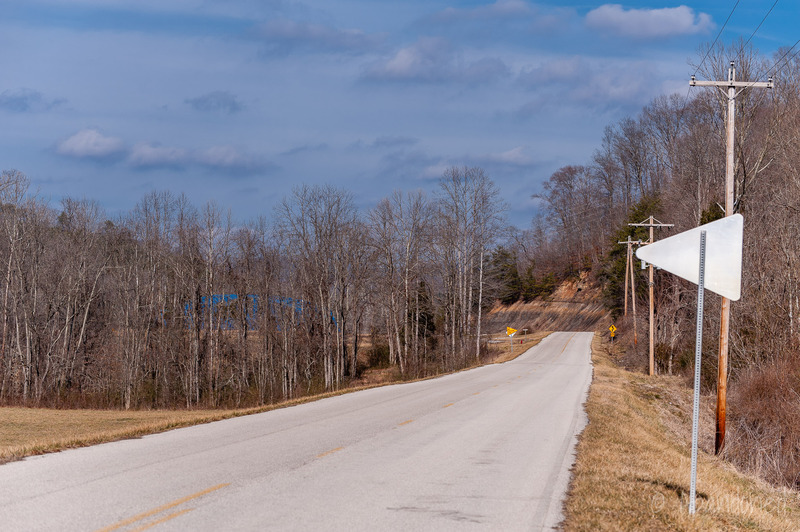 A view south of Heidelberg, Kentucky via the Heidelberg-Ida May branch. A view of a possible former freight depot in Ida May, Kentucky. Sulzer, Elmer G. “The Riney-B.” Ghost Railroads of Kentucky. Bloomington: Indiana University Press, 1998. 33-42. Print.